Training. Just Do It! | Silversphere, Inc.
← Yes! Our Call Center Is In The USA. In my experience, when people think about their Tel-Tron CompanionOne system, they generally think of a complicated and somewhat mystifying machine (“The System”) that, when all the cogs are in place, performs an automated task which thus makes their lives and jobs simpler. The System has several stages of redundancy — like our alarming console and also paging, staff phones and radios — that help keep it running, even if individual components may have failed. Training is vital to performing any job well. Not a single one of us in born knowing how, for example, to reset a pendant emergency call using a staff reset pendant. (Which, by the way, is done as follows: press the staff reset pendant first, then press the alarming resident’s pendant.) We have to learn, but there has to be a reason. People need to see why something is useful and relevant. So, let me offer a couple of practical, real-world reasons why training your staff to use your CompanionOne system should be a regular investment. Training builds confidence. Our training courses let you see a CompanionOne system in action and teach you how to use it more effectively. It’s your tool after all. Make it do what you want. Training saves you money. Would you rather wire up a new station yourself, or pay someone else to do it? With training, there’s nothing you can’t maintain yourself. Furthermore, those individuals who attend our training seminars and become certified receive free technical support — for life. Training saves lives. 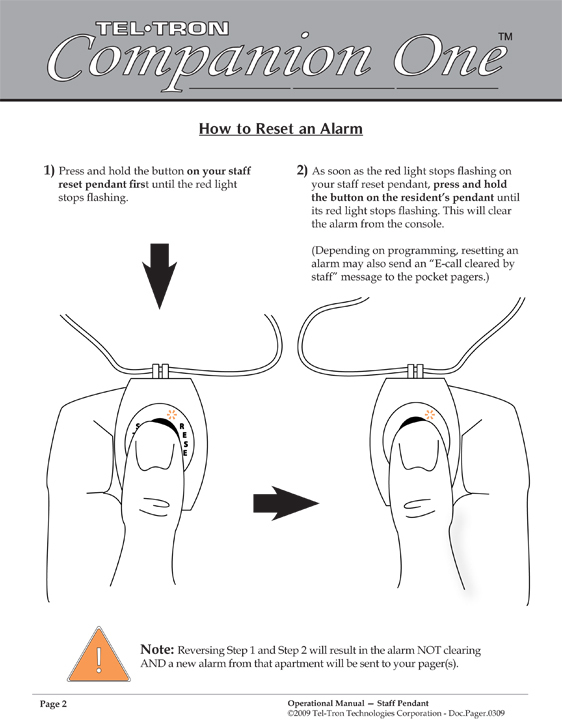 Learning to use The System effectively will decrease response times, creating a safer environment for your residents. Furthermore, improperly using or maintaining The System, like any powerful tool, can lead to unexpected consequences. In the life-safety industry, unexpected consequences can be devastating. We offer many options for training. I and my colleagues fly all over the country and offer training seminars to every one of our senior living community partners. Very often, we can come right to your community. Or you can come here to sunny Daytona Beach; we’re very flexible. For those customers who have recently installed a Tel-Tron system, training is actually free for the first two attendees. Even if you can’t attend a class, all of our user’s manuals are available online in easy-to-use, illustrated PDFs. And since I make them, I also take requests. Need a guide to something and don’t see that it exists? Let me know. It’s a safe bet if you need it, so does someone else. There’s a training option available for everyone. We can work it out to make sure you get the most from your CompanionOne system. Call me up. Get trained. Get certified. And add another feather to one of your many caps.